The 3 point linkage and front loader on my 1957 4 cylinder diesel Mf 35 have stopped working, all happened out of the blue, just worked one day then not. I changed the oil which was quite milky, front loader went up once then no more. 3 point kind of tries to rise (judders) but has no power. Any pointers as to where to start looking!!? First question is does the PTO work. If it does not then there is no drive getting through to the hydraulic pump, which would mean either problems in the clutch or rear end drive. If it is trying to lift a little bit then the above is unlikely to be the problem. a small roller on it. Try working it backwards and forwards a few times to try and free it. The spring will return it to the correct position after you have done this. Next run the tractor with the side cover still off. Put the position lever to lift and look inside to the oil reservoir. You will be able to see some slight agitation of the oil because of the rotation of the pump shaft drive; if there is any signifficant turbulence or spraying of oil would mean that there is a leaking pipe/burst o’ring etc. I suspect the most likely cause of your problem is the stuck control valve. If freeing the control valve releaves the problem for a while, but then it re-occurs, you may have a scratched control valve or corrosion in it. The milky oil (caused by water in the system) is likely to have accelerated the deterioration of the component. This is why the manufacturer recommends changing the oil every 12 months even if the tractor has not done many hours of work. 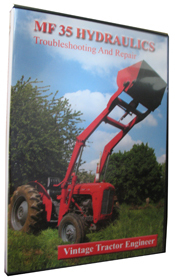 In fact the less regularly the tractor is used, then the greater the necessity to change the oil every 12 months. Hope that info helps make your diagnosis. If the control valve needs to be remove, then watch out for our MF35 Hydraulics Repair DVD to be released early in 2008 which will be of help to you. Finally found time to have a look inside. Lever with the small roller on it moves back and forth ok and springs back when released. No move ment of oil when running, but there is a bow wave when pto is engaged. There is a small amount of bubbling / movement when engine is runnig..
comes up from the pump up to the cap under the seat near your right hand leg). It is possible to check the stand pipe o’rings by removing the 2 bolts holding the cap and lifting the cap and the stand pipe (tube) out. Then you will be able to look at the seals and assess their condition. If the arms will hold reasonably well in the up position then it is more likely to be a problem with the pump (often the pump valves). So if it is not the o’rings in the stand pipe then you will have to remove the top cover (under the seat). Check the bolts that hold the lift cylinder as it is possible that these could be loose. If that is OK then there is something wrong with the pump/control valve. To remove it you need to drain the oil, remove the locating dowels which go through the side of the transmission housing and prevent the pump from rotating on the shaft. Remove the differential drive shaft coupler followed by the PTO shaft. The pump will now lift out. The pump can then be dissmantled, all the components checked and then repaired if necessary. Be very careful with arrangement of the components and make sure that everything is kept spotlessly clean. Dissmantling and rebuilding of the pump is difficult do describe in words. Good luck and let us know how you get on. 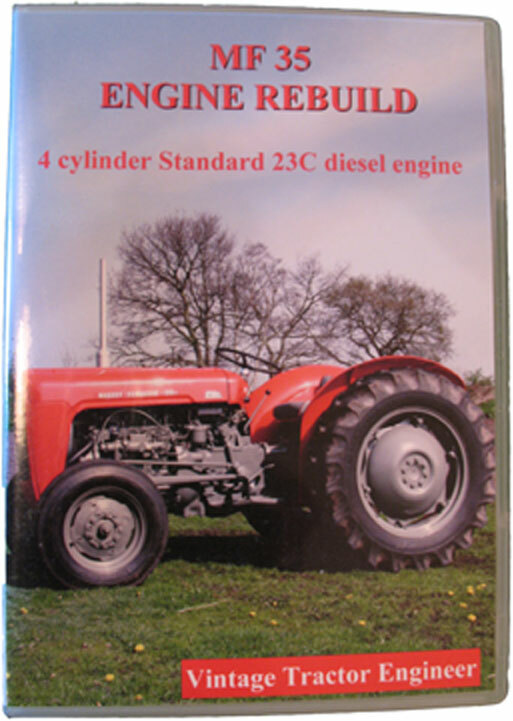 We get so many people like yourself with hydraulic problems, so we’ll have to press on filming the DVD!! Checked the o rings on the stand pipe today, one was split the other one was very worn. I replaced both and things are a little better. Rear arms rise slowly but judder on the way up, they will just about lift with me standing on them, front loader tries to lift but only gets a little way up. I notice there is a grub screw in the stand pipe housing, is this a vent plug to expell any trapped air…? I have replaced the oil recently are there any vents that i should attend to..? clutching at straws now….??! The grub screw in the stand pipe cap is just there to block the hole which has been drilled for the manufacture of the cap. It is not a vent and there are no other vents to attend to. 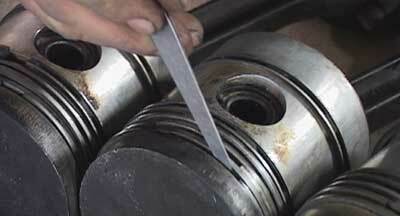 Bleeding or venting is not necessary due to the design of the lift cylinder (as the rings allow any air to escape). I’m afraid you’ll have to take the top cover off and strip down the pump. I think we’ve exhausted all the ‘easy’ options and possibilities. Thanks for your forum it got me out of trouble after changing my oil the hydraulics did not work. I replaced the o rings on stand pipe works fine again now. I had to replace my radiator some months ago and only had access to a ford x flow I stood it up and ran the hoses back then under the motor and up it works fine I did have to leave the bonnet off but it works this might help some one in the same trouble. Thanks again very helpful site. I changed the oil on my massey ferguson 65 hp, it is about a 1960 model, the gear box and pto are all in one, it took 20lts and according to the where the dip stick use to be, it is full, the problem now is, when I lift the pto with a spike to move the round bales it vibrates or jerks as it goes up, sort of like low oil, can anyone help me, do I need to bleed it somewhere, it could be air or low oil. Thanks, please. Hi im in Western Australia….. I have a fordson super dexta (approx early 1960’s) and while the tractor was not in operation, the tractor hydraulic arms were lifted (by hand) to full height. Now I am unable to lower the hydraulic arms even while the tractor is running. I loosened 4 bolts adjacent to the auxiliary port while the engine was off. A small amount of oil and air came out and the arms fully lowered. I re tightened the bolts, started the tractor, operated the hydraulics and the hydraulic arms lifted ok, and failed to lower again. What should I do? Is there any bleeding point I should know about? Do you have any suggestions on how I can lower the hydraulic arms? Thank-you. I will try this.. The situation i have on the fe35 is when the hydraulics raise the front loader or the 3 point hitch the whole tractor shakes. the hydraulics seem to pulse while the go up and down. they work but not smooth. I thought it may be the bad oil, or this screen that may be dirty. Is there anything else that may cause this to happen? Thanks for the help. There is a filter on the pump on most of the tractors.A few of the earlier tractors didn’t have the filter. You can just about manage to access the filter through the plate on the left hand side of the tractor – the plate that has the pto lever. Remove this plate and take a look inside. The filter is quite unmistakeably a filter. You may need to drop the hydraulic fluid out in order to change the filter. There is a locking wire to hold the filter in place, so you will need to be able to remove this. Is there a screen that needs to be clean in the Hydraulic system? Is there anybody that can help me with information in regards to connection for hydraulics take off for my fergy 35. where is the pressure and return attached? is the hydraulic pump always engaged? I am just looking at options for hyd. take off for mics tools. I have just read your comment on our website about your hydraulics problem. The studs under the seat are hollow and are designed to shear if something goes wrong with the system (to protect the other components). Lets hope that the other components are OK – especially the lift cylinder. The studs could have sheared for one of several reasons. Stuck control valve, incorrectly set/stuck pressure relief valve, incorrect adjustment of the system. I don’t know the history of the tractor and where/whome you bought it from, but the setting up of the hydraulics is very speciallist and needs to be done with care and attention to detail. If someone has been inside the hydraulics and they don’t know what they were doing then they can have caused the problem. PLEASE DON’T THINK I’M BAD MOUTHING THE PERSON WHO HAS SOLD YOU THE TRACTOR, THEY PROBABLY HAVE NOTHING TO DO WITH THE HYDRAULIC PROBLEM – but it wouldn’t be the first time that someone has tried to repair a hydraulic system on one of these tractor and put it back together incorrectly and then caused the studs to shear. The studs usually shear with quite a bang. You will need to remove the seat and the hydraulic top cover and take a look inside. It is no use just putting new studs back in and hoping everything will be OK. What ever caused the problem before will do the same thing again. To describe exactly what could have gone wrong and how to repair it and set it all back up properly would take pages of writing. The best thing I can suggest is our MF 35 Hydraulics DVD, which (if you watch it through – 1hr 41mins) will explain how it all works and how to set up the system properly. Sorry to give the plug for the DVD, but it is too comples to describe the system and set up in words. Hope you can get the tractor back up and running. Recently i bought an old 35 ferguson , good medal and a tight little 3 cyl. diesel engine. there were two bolts out or up of the top plate just under the seat . but nothing with the lift controls .